He was Mr Consistent in an inconsistent season for Fleetwood Town and centre-half Ash Eastham was delighted the Cod Army chose him as their player of the season. Eastham has been an ever present in League One this term, and although 14th is a far cry from last term’s impressive fourth-placed finish the defender says he is proud of his personal season. Under Uwe Rosler and John Sheridan, there have been shifts from a central defensive duo to three at the back but Eastham was always there. And that form and the 26-year-old’s increasing leadership qualities have seen him take home his first-ever player of the season award. Eastham said: “I’m delighted to have received that after a long season, one that I am personally proud of. Eastham and his team-mates will leave Poolfoot Farm for their summer break this week, with a set of new faces to greet the lads when they return in June. Sheridan took over from Rosler in February, but after completing his 13-game task to keep Town up he now hands over the baton to Joey Barton. 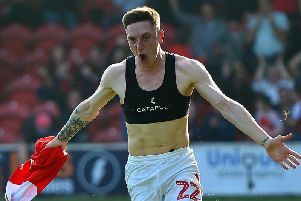 Town needed a never-say- die spirit to beat the drop and Eastham believes his work ethic is why the fans picked him as their player of the season. He said: “I’d like to think the fans see me as someone who turns up and works hard week in, week out. “Whether it is a good game or a ropy game you will never see me giving up.